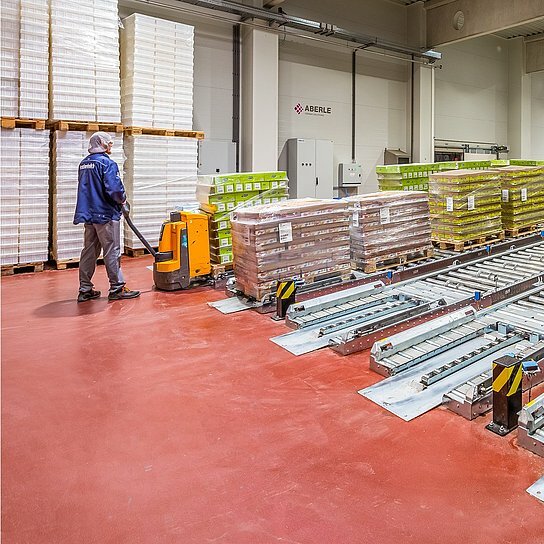 Aberle retrofitted the intralogistics of Austria’s biggest dairy manufacturer, Berglandmilch in the town of Feldkirchen, with state-of-the-art technology in record time. The dairy cooperative Berglandmilch processes 1.3 million tons of fresh raw milk every year into long-life milk, butter, yogurt, quark, and cheese. Customer needs and requirements regarding product variety, freshness, and quick delivery are constantly increasing. In order to fulfill these needs and requirements, the logistics processes in the background have to mesh as smoothly and efficiently as possible. That’s a daily challenge for the Berglandmilch dairy cooperative. Berglandmilch is one of Austria’s biggest food producers, with 11 plants and a membership of more than 11,000 dairy farmers who supply it with fresh raw milk day after day. Projected over one year, Berglandmilch processes a massive 1.3 million tons of fresh raw milk into long-life milk, butter, yogurt, quark, and cheese. The biggest cheese factory in this group of companies is located in the town of Feldkirchen to the north of Salzburg. The factory is a hive of activity all week long. From Monday through Sunday, the milk trucks drive their routes across hills and through valleys to collect this coveted raw material and bring it to Feldkirchen. “As a cooperative, we aim to meet our obligation to accept every liter of milk that our members deliver and to process it in the best way possible. That means the intralogistics processes must be optimally organized,” explains Plant Manager Thomas Osl. 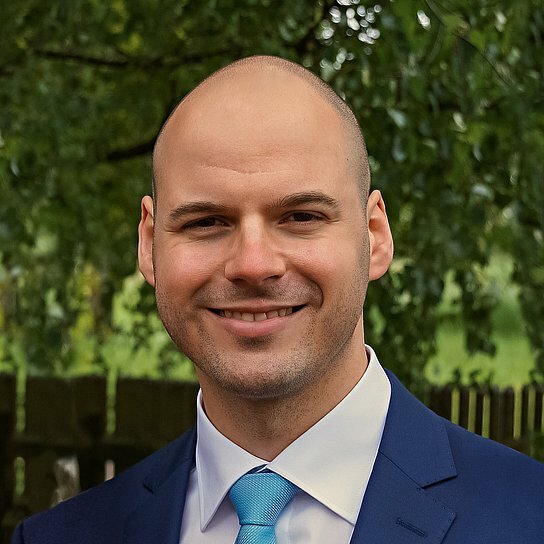 An expert on system integration: Gregor Atzenhofer, Project Leader at Aberle. The gigantic tanks can be seen from afar. In the hall with the collection points, the precious raw material is pumped into tanks. From there it goes to the production area. In just 24 hours, the dairy processes up to one million liters of milk — 365 days a year. At the end of the process, 40 different kinds of cheese, ranging from sliced cheeses to low-calorie cheese and mozzarella, leave the warehouse. In view of the extremely strict standards of hygiene and the ongoing three-shift operation, we could carry out the modernization measures only by having a precisely coordinated concept and schedule. Such huge amounts of cheese require a high-tech warehouse that operates flexibly and efficiently. However, time had not been kind to the company’s existing technology. In particular, the capacity of the warehouse where cheese ripens undisturbed, as well as the conveying systems in the dispatch area, were increasingly approaching their limits. 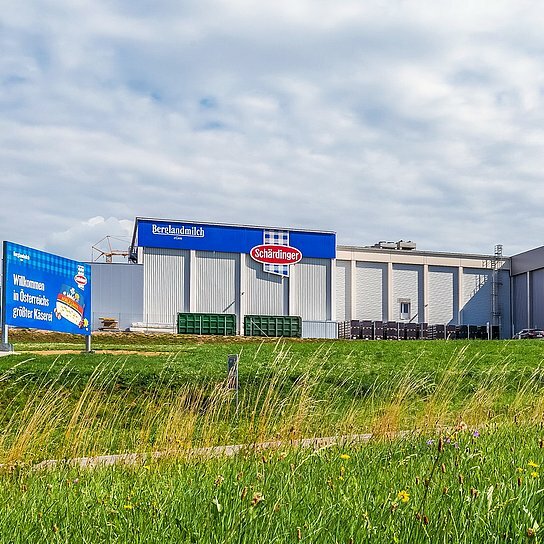 In order to prepare for further growth while safeguarding its future competitiveness, Berglandmilch decided to modernize. And that’s where Aberle’s expertise came into play. Aberle, which is part of the Körber Business Area Logistics Systems, specializes in complex industry and logistics facilities, distribution centers, and warehouses. As a specialist catering to companies in the automotive industry and in the areas of mechanical engineering, pharmaceuticals, e-commerce, and food, Aberle has supported more than 40 modernization projects. 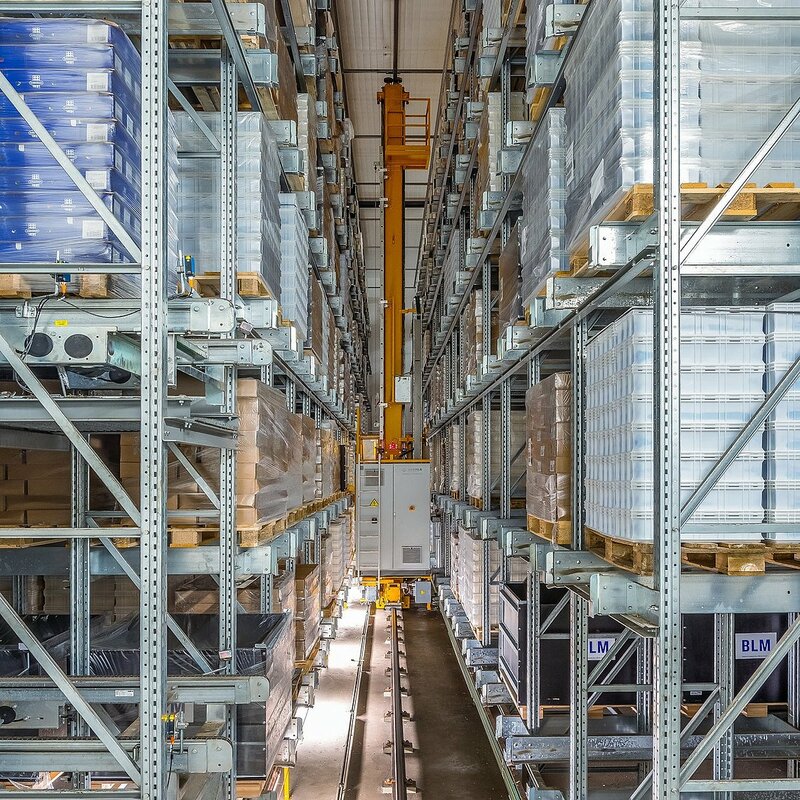 A shelf warehouse at Berglandmilch: Connecting infrastructure with new digital solutions. 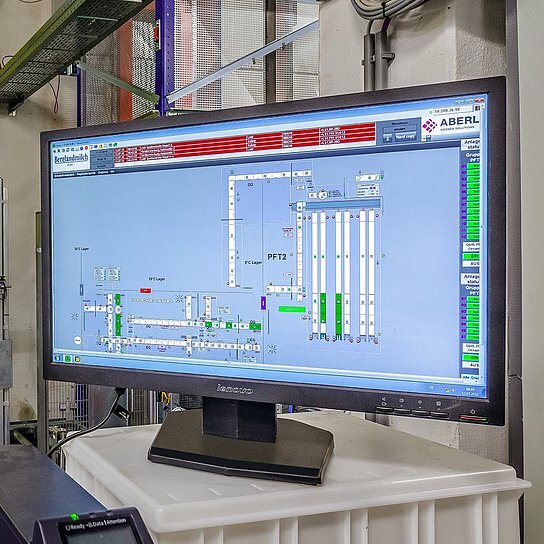 A control monitor: In order to optimize the flow of goods, a new material handling system was linked with the existing warehouse management system. Aberle pursued a retrofit approach from the very start. Instead of major new purchases, individual conveyor sectors and components at the Feldkirchen plant were to be replaced or overhauled. The IT system also had to be equipped with the latest control and automation technology. Berglandmilch benefited from Aberle’s expertise as a manufacturer-independent system integrator that acts as a general contractor and provides advice, planning, implementation, services, and maintenance from a single source. The team from Aberle faced the challenge of updating the existing facilities to the current level of technology without interrupting the plant’s daily operations. “It was a challenging project. In view of the extremely strict standards of hygiene and the ongoing three-shift operation, we could carry out the modernization measures only by having a precisely coordinated concept and schedule,” explains Gregor Atzenhofer, the responsible project manager from Aberle. It was essential that the production process of Berglandmilch, and thus its delivery reliability, should not be compromised at any time. But how can an outdated infrastructure be quickly connected with new digital solutions? “The hardware of the existing plant required only a few modifications in the shelving system and the stacker cranes,” says Atzenhofer. This is where the wheels and blocks of cheese are stored. Some kinds of cheese are stored here for a few weeks, while others have to ripen for months. In the warehouse, which has a high level of humidity and a constant temperature, the cheese gradually develops its characteristic taste and aroma. 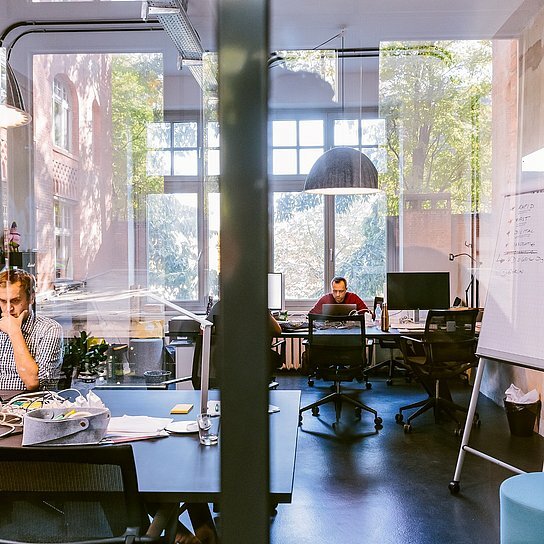 “The challenges generally tended to be more in the communication structure of the IT components,” says Atzenhofer. His team of developers programmed a gateway (an interface for data transfer in two directions) so that the existing mainframe computer could be linked with the new control software. “During the transition period, the gateway enabled us to run the old and the new control systems in parallel,” Atzenhofer adds. As a result, the outdated control technology could be successively replaced by the modern version. Aberle was an expert implementation partner at our side. It carried out the project during the planned time period without causing any cutbacks in the production or shipping schedules. Transportation of dairy products at Berglandmilch: Prepared for continued growth. New paths: How Körber Logistics Systems is shaping the transformation of the logistics industry.